"I will rule the world!" The above info came from Colhan3000, and was edited by yours truly (contact me). The image came from film.org.pl. Pilaf first shows up in Dragon Ball as its first villain for Goku to face. He is seen in the very first saga. He wants nothing more then to rule the world, and tries to collect the dragon balls to wish for it. With Shao and Mai at his side following his every order, and leaving them to do most of the dirty work, Pilaf manages to get only one of the dragon balls before Yamcha, Puar, Oolong, Bulma, and Goku break into his palace to get it. However, he seems to have the brain of an over eager child; he thinks of the most odd ball punishments, one being blowing Bulma a kiss when trying to get their dragon balls from them. 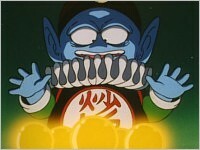 He is later seen in Dragon Ball GT trying once again to rule the world with he help of the dragon balls. However, this time it was the black star dragon balls. Before he could make his wish Goku appeared to stop them, showing up after seeing the lightening from the dragon awakening when he was training Uub on the lookout. Pilaf is the one responsible for turning Goku into a child for the rest of Dragon Ball GT.